This post is the first of a 3-part series. Check back in the next week for the follow-on pieces. We are in the midst of a massive change in manufacturing - and how well companies embrace and adapt to it is crucial to their future. Over the last several years, industrial companies have been undertaking a number of initiatives to move themselves to a goal of what has been called "Industry 4.0" or "Factory 4.0" - which embodies the idea that digital technologies are fundamentally transforming the way manufacturing works. 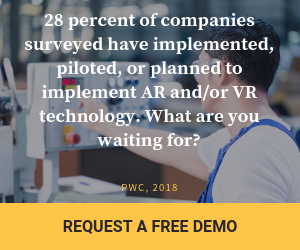 28 percent of those surveyed in a recent PwC study reported that they have implemented, piloted,or planned to implement AR and/or VR technology. According to a 2018 Global Digital Operations Study by Strategy&, the global strategy arm of leading services firm PwC, we are the beginnings of this change. The study surveyed 1,155 executives at global manufacturing companies in 26 countries and asked them about their views on Industry 4.0. and digital operation. Almost two-thirds "have barely or not yet begun" on the digital journey to realizing the Industry 4.0 vision. 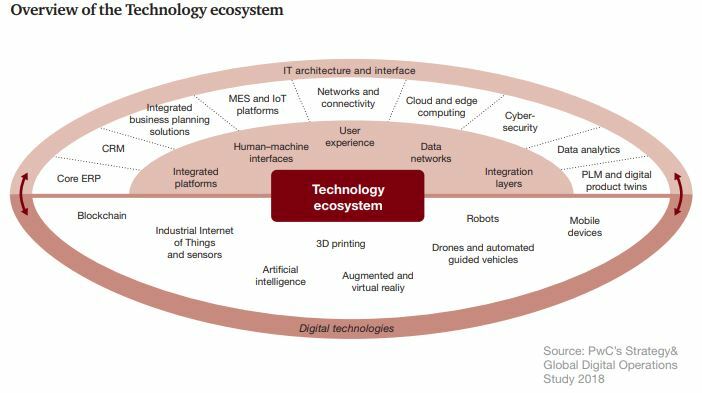 The report outlines a number of key technologies which make up the ecosystem that underpin this digital transformation of manufacturing - an ecosystem that includes both Augmented Reality and Virtual Reality. It also found that 28 percent have implemented, piloted,or planned to implement AR and/or VR technology. The PwC survey calls out the value of AR and VR solutions as key elements of "maintenance, service, and quality assurance" as well as self-learning and training - and it definitely fits with what Atheer has seen in terms of the strategic planning being undertaken by our customers. Done right, AR solutions are a key element of an overall digital manufacturing strategy. As we noted in our recently-published White Paper - Transforming the Enterprise - assessing how an AR system can benefit your business is not just a question of looking at a few reviews in industry journals and then recommending the purchase of a few tablets, smart glasses or smartphones – along with AR applications - to evaluate. To implement AR in a way that’s truly effective and transforming, you need to take a broader look at the real underlying needs of your business, what other changes you may be making in the business (in the short, medium and long term), and how AR solutions could intersect with all of those changes to provide effective, reliable benefit in your company’s transformation to reach your Industry 4.0 goals. Any decision to deploy AR technology also needs to fit within your overall corporate IT plan. The AR deployment may well start as an independent pilot – or a limited trial in the field – but for company-wide deployment, it should fit within a manufacturing organization’s broader plans and goalhttps://content.atheerair.com/transforming-the-enterprise-whitepapers. For more on developing an Industry 4.0 strategy, download our recently-updated White Paper: Transforming the Enterprise. In the second part of this series, we’ll take a look at how AR technologies integrate with many of the other key components of a digital industrial enterprise strategy (including Internet of Things (IoT) devices and big data) to enable a complete change to the way industrial enterprises do business.